eligible candidates can apply for these posts through offline mode only. The application forms are available from 19-12-2018 onwards. The last date for submitting the online application form is 21-01-2019. Candidates can submit application form online https://districts.ecourts.gov.in/belagavi-onlinerecruitment website of Belagavi District court Belagavi. The candidates will be shortlisted on the basis of merit in written exam/skill test and personal interview. 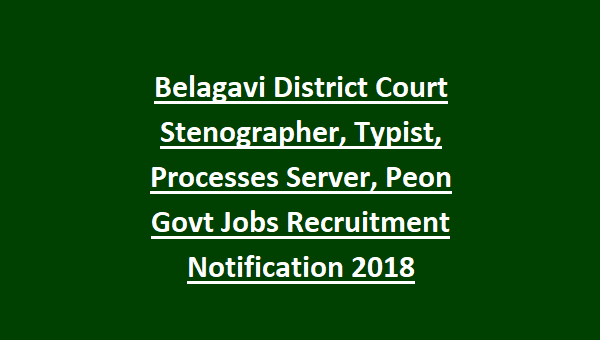 For other details of age limit, educational qualification, salary, application fee and how to apply are given below for the jobs of Stenographer, Peon, Typist, Copyist-Typist, Driver and Processes Servers in Belagavi district Court Recruitment Notification 2019. 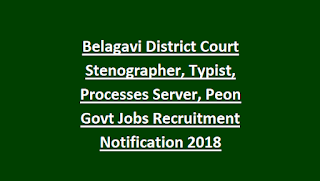 There are total 35 posts available for Stenographer, Peon, Typist, Copyist-Typist, Driver and Processes Servers Jobs in Belagavi District Court. Candidate’s age limit is for Belagavi District Court jobs is in between 18 – 35 years. Stenographer – Candidates must have passed SSLC and senior grade Shorthand and Type writing examination in both English and Kannada Language. Peon – Candidate should have passed 7th class and able to read and write Kannada and English. Typist – Should have passed SSLC and senior grade Type writing examination in both English and Kannada Language. Copyist-Typist - Should have passed SSLC and junior grade Type writing examination in both English and Kannada Language. Processes Servers – Should have passed SSLC. Candidate can refer in the Official notification. The Candidates will be selected on the basis of written exam/skill test and personal interview. Candidate scan refer in the Official notification. Interested candidates can apply for Stenographer, Peon, Typist, Copyist-Typist, Driver and Processes Servers is through offline mode only. Eligible candidates can submit the application form online in official website of Belagavi District is https://districts.ecourts.gov.in/belagavi-onlinerecruitment. After download the application form candidates fill the form with necessary information and send the form with scanned copies of signature, photographs and relevant documents to the given address.